Ensure that we’ve responded to everyone who’s been in contact. Due to a technical issue, we missed being notified of a number of contacts in the past two years. We’ll go back now and make sure that we haven’t missed any. Apologies if you’re still waiting for our response! We’ve now got photos of all gravestones in the St Mary’s cemetery as well as the Boasley Methodist Church cemetery, about 700 gravestones in total and perhaps a thousand burials. We’ve also got notes on everything we could make out of what’s inscribed on the gravestones. We’ll get all this onto the site and also add the photos to the brilliant work done by Ross Morton on FindAGrave to list all St Mary burials back to the beginning of the registers in the mid-1500s. Not surprisingly though, basically all of the still existing gravestones are from the 19th and 20th centuries. We spent the past three years engaging a highly experienced translator, Brooke Westcott, to translate the 10 surviving Bratton Manor Rolls dated 1377-1683 and these translations are now complete. 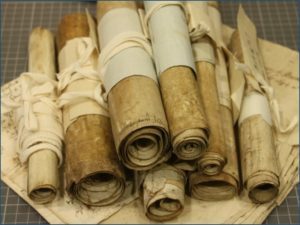 We’ll get them on the website along with a video presentation I made to the Guild Manorial Records seminar that introduces the rolls. We’ll also make sure that The National Archives and Devon Heritage Centre get copies of the full transcripts and translations so that they will be preserved for the future. They provide a fascinating view of life in medieval Bratton Clovelly. We’ve recently transcribed the baptism registers for the Northlew Bible Christian Circuit, as part of a nonconformity project that I’m working on with the Family and Community Historical Research Society. 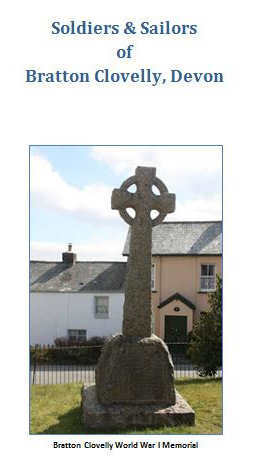 About a quarter of Bratton Clovelly parishioners who attended a religious service at the time of the 1851 Religious Census were Bible Christian and the baptism registers have unearthed a substantial number of ‘missing’ baptism records for parish residents who attended the Boasley and Bratton Village chapels. Launceston Circuit baptism registers covering the Rexon Cross chapel are already available under non-conformist baptisms on the Cornwall Online Parish Clerk database at http://cornwall-opc-database.org/ but we’ve also transcribed the baptisms in these registers for those resident in Devon and will add them to our site. We’ve recently photographed the Holsworthy Circuit registers which we hope will unearth even more baptisms for Bratton Clovelly residents and we plan to transcribe these in 2018. Our good friend Celia Eastlake has kindly sent us a copy of an important new publication called Devon Parish Taxpayers 1500-1650, Volume Two containing Bratton Clovelly. As we had suspected from the Bratton Manor Roll translations, the 1601 Church Rate roll confirms that essentially all but the smallest farms in Bratton Clovelly today were already in existence before the start of the Early Modern period. This parish does have remarkable staying power and we’ll get this tax list on the site along with a map that correlates it with the modern day parish. Our biggest Bratton Clovelly effort this year will be to complete the nonconformity project called ‘Communities of Dissent’ with the Family and Community Historical Research Society. Of course, our interest is in Bible Christianity in Bratton Clovelly and our goal is to try to identify and characterise the nonconformists of the parish between 1841 and 1911. We hope to learn a great deal more about the Methodist history of the parish by the end of 2018 and will share our findings. As we say at the start of each New Year, we’re going to try to do better with adding blogs to the website on a routine basis to keep everyone aware of any progress. Now our goal is one per quarter. So that’s our key aims for this year and we sincerely hope that you will get in touch and share your memories and knowledge of the parish so that the study can capture some of the ‘people aspects’ of the parish history. It’s a wonderful place and, although we can’t visit often now that we live in Malta, it will continue to capture our attention in the years to come. 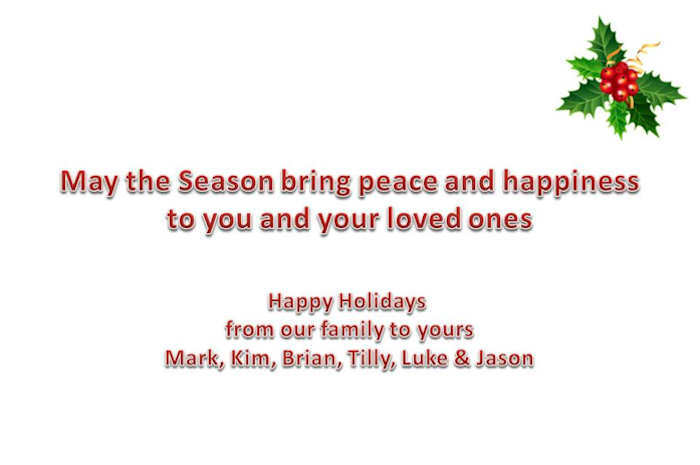 The best wishes to you and your family for a wonderful year! No, we haven’t forgotten Bratton Clovelly. It’s just been another very busy year. 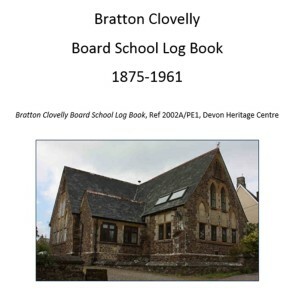 So to make up for lost time, here is a transcript of the Bratton Clovelly Board School Log Book. It’s not the kind of historical record that lists the name of everyone in the school, although it does have many references to staff, church and parish officials, those who gained entry to secondary schools, those who became ill and the like. But what the Log Book is best at capturing is the rhythm of daily life in the parish, things like the harvests, holidays and celebrations, weather, disease, examinations and the comings and goings of children to and from the school. The Log Book also captures a lot of change, such as changing attitudes toward schooling, the rise of health care, the expansion of central government, the impact of war as the London evacuees arrived and, of course, the shrinking school population and its eventual closure in 1961. We hope you’ll find something of interest! If you have memories of the school, please feel free to share them by leaving a comment below or sending us a note. It’s been a very busy winter and I’m sorry to have been neglectful of the blog. But we’ve finally gotten to a point in researching the soldiers and sailors of Bratton Clovelly where there’s more to share. Information on all the military members that we’ve found who are related to the parish and served in the 19th and 20th centuries have now been added to the Records section of the website. We hope that this is just the beginning, though. 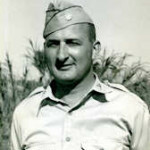 The historic records can only tell part of the story and undoubtedly there are others who served that we haven’t found yet. So our hope in sharing this information is that those of you who know of these service members or their families will be able to help make the stories more personal and complete. Any information will be of value, like regiments and service numbers, but it’s the family stories, photos and mementos that will help everyone to remember best. If you would like to take a closer look at this information, we’ve made a pdf booklet that can be printed out. Just click here for this booklet, which contains everything we’ve discovered so far. Please contact us if you recognise anyone! It’s been a while in the making but we’re very pleased to now publish what we’ve learned about the Bratton Clovelly soldiers who gave their lives in World War I. The more we looked at the records, the more we realised just how huge an impact the War had on this parish. Soon we’ll also be publishing a list of all the soldiers and sailors we’ve found who served in the War, including those who thankfully returned. It’s a long list probably accounting for at least half of the men of the parish born between 1880 and 1900. No family seems to have been left untouched. The information we’ve assembled is from the historic records, sources like the Commonwealth War Graves Commission website, WWI Medal Cards and Voter Lists. One of the most helpful sources has been the local newspapers where you can find mention of people home on leave, those being promoted, soldiers reported missing or injured or prisoners of war and, of course, the notifications of those who had fallen. But the stories could be so much better with family memories and photos that really help to describe all these young people who sacrificed everything. If anyone has information that they are willing to make public, please contact us so that we can share it with others. The work on the soldiers and sailors of the parish is a labour of love for us, especially as both Mark and I come from military traditions. 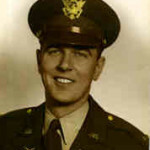 My grandfather, Colonel Roy F Blackmon (1909-1988), US Army, served in Europe in World War II, the husband of Marion Elizabeth Eastlack (1910-1999) of Bratton Clovelly descent. 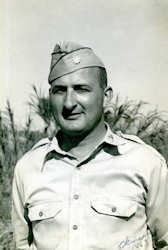 He left his WWII memoirs which we hope to share in the future. 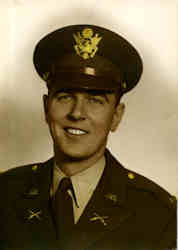 My father, Donald T. Kirwan (1928-1993), was a Company Commander in the US Army Reserves during the Korean conflict. My own career started when my grandfather commissioned me as a Computer Technology Officer in the US Air Force. 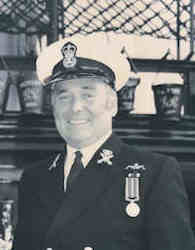 Mark’s stepdad, Chief Petty Officer Leslie A Smith (1934-2013), MSM, spent 40 years in the Royal Navy, 35 in submarines. We are committed to keeping the memory of those who gave so much. Bratton Clovelly is a genealogist’s dream, thanks to a long line of church leaders, clerks and historic families who maintained the parish’s baptism, marriage and burial records. They’ve left a legacy of parish registers dating back to 1555 full of information on the people of Bratton Clovelly’s past. Over 4000 baptisms, 3000 burials and 1000 marriages are recorded. Within the next few weeks, these records will be transcribed and available to help reconstruct the families of the parish. Admittedly, it is just a first draft transcription so there will be errors and gaps where the registers are particularly challenging, but we hope that over time people will let us know of corrections so that we can keep improving the quality of the transcripts. Although it will be a long-term project, we want to use these transcripts to try to build the family trees of the parish. Our approach will be to choose the most prevalent surnames from the registers and construct trees for each of those surnames. There will be limitations to this approach, not only due to errors and omissions in these first draft transcripts but also because there are many people who may have lived in Bratton Clovelly but were not born there. In addition, they may have married in other places or moved away from the parish. We will limit these trees to the generations where the families have had a fairly continuous presence in the parish but there will still be lots of missing bits of information. A request for help: If you have worked on a family tree for a family that has a history in Bratton Clovelly, we would appreciate hearing from you. As with all of the information we have collected on the parish, you are welcome to use whatever we have found out about the parish as you see fit. Our request to you is that it would be helpful if we might use some of your information to fill in those gaps in the parish records where people have come into the parish, married elsewhere or left the parish. Combining our information will lead to a more accurate and complete story of the parish’s past. One of the main things that differentiates a One-Place Study from a family history study is that there is as much focus on ‘Place’ as on ‘People’. For this study, that means that we’re trying to understand as much about the properties of Bratton Clovelly as the families who lived in, conducted business in or owned these properties. Our goal is to eventually reconstruct the lineage of each property as far back in time as records permit. But our first step is to try to understand where the properties are located. A great resource for this search is the Tithe Survey of 1845. Detailed maps and property descriptions were drawn up in response to the Tithe Commutation Act of 1836 which substituted a monetary payment for the wide variety of ‘tithes in kind’ that had previously been paid. 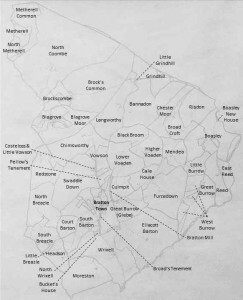 The result of this is that we have maps that can pinpoint where each farm was in Bratton Clovelly in this timeframe, owners, tenants, the use that each parcel of land was being put to and a relative value for each parcel. Although the residences within Bratton Village itself are not generally named, the owners and tenants at each property unit in the village are identified similarly to the farm properties. The maps and corresponding tithe apportionments are held at Devon Heritage Centre. We have used these maps (which are quite large) to provide a less detailed version for viewing on the website. Click here to get a better look at these maps and click here to see the tithe apportionments and detailed information describing each property. When viewing the tithe apportionments, notice the links in the ‘Property Detail’ column which will show you the breakdown of the small parcels of land (fields, houses etc) that make up each property. In 1989, the Roadford Reservoir was created just to the west of Bratton Clovelly. It’s a huge expanse of water, fed by the River Wolf, that provides much of the fresh water supply for the Southwest of England. Did you know that archaeological excavations were done at this site before the water covered the ancient settlements along the River Wolf? Did you help to build the reservoir or participate in the excavations? Did you know that a documentary series was made of these excavations and it’s available online to UK viewers, courtesy of 4 on Demand? The field reports are kept at Exeter Museum and listed at GenUKI. Narrated by Mick Aston of the University of Bristol, the same Mick that went on to feature in the popular and long-running Time Team series, this set of documentaries called Time Signs works backward through the history of the area from present day to neolithic times. The first episode starts with the recently abandoned farmstead of Shop Farm to explore what we can learn from buildings still standing. Episode 2 begins with a short look at what might be found near the surface of a Bratton Clovelly garden and goes on to unearth the 19th century settlement at Hennard Mill. It also provides a short but remarkable tour of the Church of St Mary the Virgin at Bratton Clovelly. 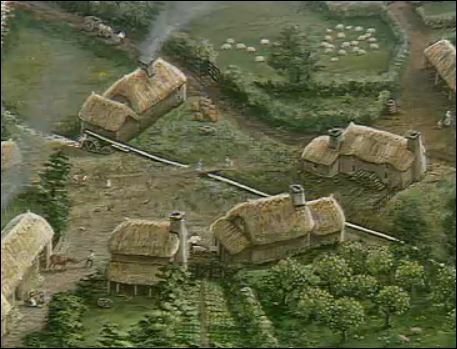 Episode 3 jumps back to the underlying settlement at Hennard in the Middle Ages, already the site of a fulling mill in the 13th century. This episode ends with a closer look at Broadwoodwidger’s St Nicholas, with benches built the year of the Reformation Parliament in 1529. Episode 4 then travels back to the prehistoric occupants, thought to have first permanently settled in the Wolf Valley about 4 to 5,000 years ago. Overall, it’s incredible to see the story unfold. For those unable to view the Channel 4 programmes, click here for more information. In 1887, Rev Sabine Baring-Gould published a novel called Red Spider, set in nineteenth century Bratton Clovelly. He even checked the parish registers to ensure that he used real historical surnames and he knew the territory well, born in Exeter and parson of neighbouring Lewtrenchard. 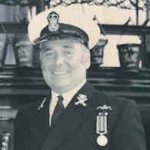 You can see him in the parish registers officiating at some of the services in Bratton Clovelly. Sabine was a prolific writer, one of the most popular novelists of the time with over 1200 publications to his name. He had numerous other pursuits as well and you might recognise his name from his hymn, ‘Onward Christian Soldiers’. His memory is being preserved to this day through the efforts of the Sabine Baring-Gould Appreciation Society. Red Spider is available in bookstores but, even better, it’s free online through the Internet Archive, http://archive.org. So here’s some questions for those familiar with Bratton Clovelly and with Sabine’s book. Do you think that Red Spider is a fair depiction of life in Bratton Clovelly in the 1800s? Was the story of the red spider real folklore in West Devon? And do the characters sound like those you’ve heard of from the past? If you grew up in the parish, did you read the book as a child? For those of us trying to get acquainted with this part of the world, it would be good to know how well Sabine did with capturing the time and place. We’ll use this part of the site to highlight things we’ve heard about Bratton Clovelly’s past that we hope are of interest to others. Please join in the conversation!